What do you need? First, an antenna—10 or 15 feet in diameter (see photo above) —to gather and concentrate the microwave signals. Weakened by their long journey, the signals must be amplified, then converted from the very high frequencies the satellites use down to standard UHF frequencies. This job is done by electronic equipment—a low-noise amplifier and what the industry calls a down converter. Coaxial cable carries the signals inside to a receiver. It has no screen or speaker, but it may have a demodulator to convert the signals to frequencies your TV set can pick up. The cost of all this has come down drastically. Commercial versions once cost hundreds of thousands of dollars. Two years ago you’d pay at least $10,000 ($31,000 in today’s dollars) for a “turnkey” system, installed by the dealer, to pick up just one channel on one satellite. More versatile systems cost up to $36,000 ($112,000 today). At the STT show, I saw good basic systems that cost about $5,000 ($12,400 today), installed. High-end systems with superior reception and convenience features go to $16,000 ($40,000 today). There’s an even cheaper route. You can assemble your own antenna from a kit, pour the concrete footing, raise the antenna, and cable the electronics together. 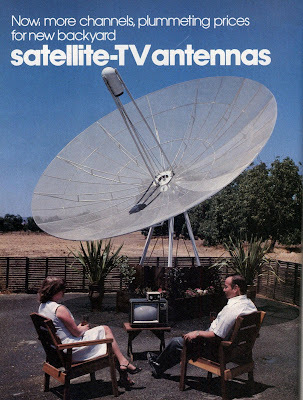 For $6,995, you can buy a bolt-together antenna and a semi-assembled receiver from the Heath Company ($17,000 today). This kit rivals the $16,000 ($40,000 today) systems in sophistication." Don't forget shoveling the thing out when it snows. And, I tell people that Solar Panels are going to come down by 30 or 40%, and they tell me I'm a loon. Go figure. I tell people that Solar Panels are going to come down by 30 or 40%, and they tell me I'm a loon. They're loons -- of course, they'll come down. But the sun will still go down at night and you'll never get more than 1kwh/sq m.. Capital (whether private or public) will never change that. Doesn't matter. That's a million kwhrs/sq kilometer, and a square kilometer is cheap in the desert. Craig, yes, and computers will never be smaller than a two car garage. those dishes have transformed rural America... you see them everyone even in the most remote places...no longer forced to use TV antennas to pull in one or two snowy channels. Oh... an anyone who bets against Solar over the long run - is going to lose big time. waiting for Solar to fail.. is a bad bet.. given the countless examples of how technology inevitably advances. >> And, I tell people that Solar Panels are going to come down by 30 or 40%, and they tell me I'm a loon. Go figure. They're telling you you're a loon because you're a loon. Don't fool yourself Dufus, I already made a hash of your idiotic arguments previously. >> a square kilometer is cheap in the desert. And, as I pointed out before, and you utterly blew past in your determination to Believe What You Want (hence proving/justifying the above "You're a loon", making it not an ad hominem statement) is that the Greens will never, ever let you get away with covering a million square kilometers of desert with little blue panels, even IF they came down to the price point your fantasies imply. >>> Craig, yes, and computers will never be smaller than a two car garage. Sorry, not the same argument in any way, shape, or form. This isn't "making it smaller, cheaper". It's dealing with actual physical limits -- the sun drops, under perfect conditions, not more than roughly 1kw of energy per square meter of surface. PERIOD. You can't GET more energy than that, no matter how magic your equipment is. Half that for 12h a day, half again for vaguely realistic but VERY optimistic 50% conversion efficiency, and you're not talking about covering FOUR meters for every kw you want. And if you want it at night? You'll need to store it, with another 50% or more loss, so SIX square meters per kw. Energy usage in USA is ca. 1 BILLION kw, so you'll need to cover around SIX BILLION sq. meters with these cells. ...and I'm not even going into lifepan of the things, which is typically 10-20 years, depending on how low you're going to let their efficiency get before replacing. And the greens, and most other people, are going to #$%#$%#$ FREAK when you tell them that you want to produce/replace/recycle 6 BILLION sq. meters of panel every 10-20 years. IT'S AN EPHING PIPE DREAM based on MASSIVE IGNORANCE of numbers, power, physics, economics, chemistry, ecology, and human nature. >> Oh... an anyone who bets against Solar over the long run - is going to lose big time. I offered you and Dufus an Ehrlich-Simon wager, Larry. You didn't seem interested, somehow. I repeat the offer. Put your money where your mouths are. "Whoa, wait! Four BILLION sq. meters? Billion? With a "B"? Holy CRAP!" And that's highly OPTIMISTIC, based on stuff we currently CANNOT DO and have no clear idea how we MIGHT do. That's based on your own ideas of how tech improves things. Reality is more likely 2x-3x that or more. You are NOT going to be able to DI IT -- cover a billion or more square meters with solar cells. how much land abuts the interstate highway system? with your 4 billion number.. how about some context. how much land is that? Six billion square meters is 6,000 square kilometers, which sounds like a lot. But the Mojave Desert alone is 64,750 square kilometers. There are hundreds of thousands of square kilometers of desert in the US besides the Mojave, and even more is available if we're willing to work with the Mexicans. I don't know whether the public + private price of solar power really will come down or not, but if it does, we've got more than enough space to make use of it. but as far as I know.. the efficiency is something that technology is expected to improve (as opposed to there being absolutely no way). betting against this happening would be a bad bet.. the only thing in doubt is the time-frame. "but as far as I know.. the efficiency is something that technology is expected to improve (as opposed to there being absolutely no way)." The number OBH gave you, of 1kw/sq. meter is a maximum for a surface perpendicular to the direction of sunlight, at noon on a cloudless day. A maximum energy of 6.2 kwh/day per sq. meteris available at this rate of insolation. At higher latitudes, the maximum amount is lower. There is nothing that can improve on these numbers. A solar panel working at 100% efficiency, which isn't possible, could produce 6.2kwh/day per sq. meter. While today's best performers at 30-40%, or 2.4KWh/day per aq. meter may be improved on in the future, there is a definite foreseeable limit of perhaps double current efficiency. Nothing like the improvement in satellite antennas is possible. Nothing like the improvement in satellite antennas is possible. if Solar went to 50-60% efficiency? I assume that it means that you then need X number of acres to generate what? how much of the demand? 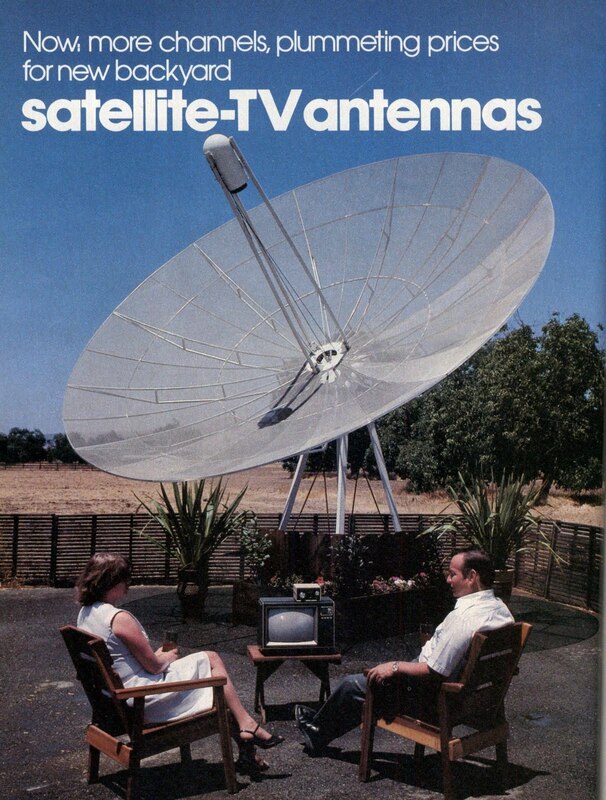 "Nothing like the improvement in satellite antennas is possible. if Solar went to 50-60% efficiency?" At 50-60% efficiency you would have nearly double the output of current PV panels. and ask... if that is the limit - what is the point being made..."
The point, Lar, is that it is easy to measure the amount of sunlight striking the Earth's surface at any point, and there is a well known maximum. That is approximately 1kw/square meter maximum. No matter how clever you are, no matter what technological improvements you make, you can't get more power per meter than that. That means that you will not see improvements of an order of magnitude as you saw in satellite antennas. I thought I made that pretty clear, as I knew who I was responding to. I guess I was wrong. Links? You want links? If you Google "solar insolation" you will get more links than you can follow before your bedtime, but I will give you a couple of them. The Solar Trading Post will start you with some good general information, and you can select some links on that page, including Wiki. I know you like that one. You can also select a US map that gives you some insolation values. Here is a government site. I know you're fond of those also. Don't get confused here, there's a lot of information, and plenty of links. Here's one from Solar Panels Plus. Notice that their numbers are a little lower than the others you've seen. I believe they are using actual measurements, not estimates. This would include such real world things as clouds. I don't think any of these sites is a right-wing propaganda mill, so you can't dismiss them with that excuse.
" I thought I made that pretty clear, as I knew who I was responding to. I guess I was wrong." If we are only able to harness 25% of it - during the day only of course.. how much land would be needed? but if we got a breakthrough to take us to 50-60% then only 1/2 the land area would be required. the other thing I was asking is how much electricity would solar have to produce? how much land would it take for SOLAR to produce sufficient electricity to power the country during the day? what is that number ( assume no costs - we're just want the area of land needed). "My calculations put it at about the size of Rhode Island..."
That is the area of solar panels required. You can estimate the amount of actual land needed by looking at the numbers for existing solar farms. "but if we got a breakthrough to take us to 50-60% then only 1/2 the land area would be required." What if? What if? What if the sun suddenly became twice as bright? Then we only 1/4 as much land area would be required. You can not plan such things using what ifs. "the other thing I was asking is how much electricity would solar have to produce?" how much land would it take for SOLAR to produce sufficient electricity to power the country during the day?" You can do that simple math yourself, but that's not the issue. You can't just cycle coal or nuclear plants up and down at will. You can't use only solar during the day, unless you don't mind just venting steam to the atmosphere during the day while the turbines are idle. "what is that number ( assume no costs - we're just want the area of land needed)." You can calculate that yourself, based on what you're really trying to demonstrate. You can't run on solar only, all the time, nor can you do so just during the day. Solar can help during periods of peak load, which are mostly during the day. supplemental energy. That's all solar can do. without some cheap, efficient storage technology that doesn't exist at this time. It's easy to come up with simple answers, as you do, but you have to ask yourself: If it's that easy, why isn't it already in place? solar in combination with coal can reduce the about of coal base load as long as you have natural gas to handle the peaks..
... and if you think about this... solar at a home with a natural gas backup during the day can (and is) dealing with grid shortages... (brown outs) and mitigate the need for new base load capacity. solar is going to be the ultimate winner.